This was going to be a short article telling footballers to stay out of the Scottish election. But that post will come later. “We will urge Wayne Rooney not to honour the devil by wearing this shirt nor kiss this badge. We will urge Christians to put their money elsewhere than Manchester United and its sponsors of Satanic worship. Repent and put The Cross of Jesus Christ or at least Star of David on your shirts. Manchester can never be United under Satan. Manchester can only be United under the Christian-Jewish God. We advise Christians in Manchester to support Manchester City, Bolton, Stockport or Burnley until the board of Manchester United change the official club symbol of Satan on all shirts, merchandise and their website." Ah, the brave new dawn of Scottish democracy. It was ever thus – extend democracy and every nut case with an ego will try to get elected. 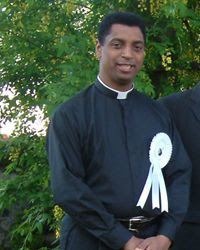 So please step forward Reverend Hargreaves: policies include a referendum on capital punishment, teaching school children that the bible is the ultimate authority on ALL matters and teaching school children that homosexuality is an abomination. A couple of things George: you can do nothing about Manchester United as you are trying to be elected in Scotland. You might want to cast the good book aside and read Scotland's devolution settlement before talking absolute tosh. More importantly you say that your policies are about freedom but what freedom do Jewish, Muslim, atheist or children of any other belief system have when you force your beliefs on them. But, then, it doesn’t matter because George would allow corporal punishment to beat the heathenism out of any child dissenters. And how would George tackle sectarianism in football? I don't know because he steers clear of any mention of it in his manifesto (think Mein Kampf without the humour). That is almost certainly because lovable old Georgie thinks there is absolutely nowt wrong with a bit of sectarianism (provided it's directed at the right people of course). George you are as dangerous as the BNP. And you are as far removed from showing true Christian values as anyone in our society. Hardline nonsense like yours will contribute to this country becoming Godless much more effectively than the efforts of a million atheists. And of all the things Wayne Rooney has done in his life kissing the badge of his club is probably more Christian than paying to sleep with a grandmother. Sorry to get political but if you don’t believe that George is dangerous look at his namesake Bush in America. The Christian right can influence people and can influence presidents. And anyone that forces us to give up the moral high ground and stop us laughing, with a casual superiority, at America does not deserve our support. Vote Rooney, Vote for the (Red) Devil, Vote for Choice Not for the Cross! Old Firm games always matter or so I’ve been told – often quite forcibly by Old Firm supporters. Celtic fans might well be willing to argue with that today after their team’s annihilation in the Scottish Youth Cup final yesterday. But how the Rangers fans will revel in the irony that a young man named Lennon scored a hat-trick against the old enemy. I dare say Neil will not be unduly bothered by young Steven’s achievement but it will no doubt raise a titter in Govan. Youth teams, of course, can promise much and not translate that potential to the bigger stage but let’s hope the Rangers team can make an impact in Scotland – and that their hooped counterparts can recover and make similar strides. Young Scots playing in Europe for the Old Firm can only be a good thing for the Scottish national team – however much that sticks in the craw of those of us who seek succour outside of Glasgow’s dominant forces. The next challenge is for the players – and their clubs – to show the desire and commitment to stick with it and progress. That is often easier said than done – although John Kennedy’s return to action shows that Old Firm youngsters can prosper in adversity. Perhaps the bleakest note of the night was the attendance. That 11,486 supporters watched the match at Hampden should fill us with joy. That 3000 less people watched two SPL sides in a Scottish Cup semi final only 48 hours earlier is on a par with any embarrassment the young Celtic players felt. Hampden this week has provided a forensic examination of the Scottish game: and the future is far from rosy. Another season, another club, another departure. Just what is wrong with Ian McCall? His “amicable” split with Queen of the South marks the end of his sixth spell in management. It is suggested that his next stop will be Partick Thistle. Which seems obvious enough because Thistle are a club crying out for a manager that seems to offer no stability whatsoever. Clydebank (during which time they tried to move to Dublin), Airdrie (the last manager in their history), Morton (too expensive), Falkirk (jumped ship after 30 games), Dundee United (28 games won, 40 games lost) and Queen of the South (different ambitions from the board). Six clubs, six departures, no periods of stability. Now, there is bad luck, there are misunderstandings and there are personality clashes. But McCall seems to attract all three with unerring regularity. Yet still he gets jobs. He’s underachieved as a manager as he underachieved as a player but a scary number of clubs seem to want his services. Firstly, and it’s only my theory, McCall is a media darling. He lives in Glasgow’s West End which remains Scotland’s media centre. He’s the BBC’s main analyst despite having the incredible ability to make one pine for the commentary of Jock Brown. But the media deem McCall a character: this relates to anecdotes from his playing days when he first defecated from a step ladder at Rangers (leading Graeme Souness to boot him out) and then defecated in player-manager Simon Stainrod’s shoe at Falkirk (what boot Stainrod kicked him out with is unclear). Clearly this is a classy guy with a frightening level of sophistication. Secondly, Scotland is a small country. That’s why the same actors appear in Take the High Road, Taggart and River City. And it’s why the same managers keep cropping up at different clubs. And, to short sighted club directors, McCall is attractive because of the high media profile that his moments of comedy excellence have so deservingly brought him. So McCall keeps getting jobs and fans keep getting promised great things only to be awarded with mediocrity and abrupt departures. But perhaps anyone hunting for new managers should study McCall’s comments yesterday: "The First Division is not easy, and will be even harder next year." The challenge is never quite so appealing when you know the BBC will keep you in beer money. Jesus Saves! And Denis Law scores on the rebound. Substitute the Lawman for your own favourite striker and I’ll bet you’ve heard, or read, the joke somewhere. It’s a lame joke of course. But now it appears it’s a joke based on a lie. 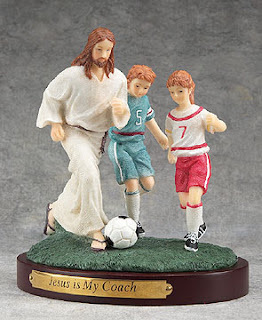 Jesus was not a goalkeeper but was – and still is – an outfield player who liked to take on two teams of children at the same time. There is no mention on the website of this being available for different teams but I guess you could quite easily paint JC’s robes in whatever colours you like. And, as a crowd pleaser bursting with show stopping tricks, surely white sandals would be his preference? 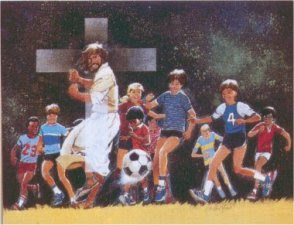 And, to complete your collection how about this painting of Jesus bursting free from the cross to hunt for the ball as his child followers look on. It was, apparently, a first draft of the Sistine Chapel ceiling! These classy items come from America and I dare say a thesis could be written on soccer moms, the Bible belt and neo-conservatism. But it might be more effective just to laugh in their faces! It’s been, well, fun isn’t really the correct word. Compelling? Possibly. Entertaining? At times perhaps. Because let’s be honest Neil Lennon and Scottish football have been a combustible mix. The good stuff: five SPL titles, three (possibly four) Scottish Cups, two League Cups, qualification from the Champion’s League group stages and a UEFA Cup Final. It is an honours list that proves the value of Lennon’s contribution. And, having seen the way that the UEFA Cup final passed him by, it is a testament to his commitment that he’s lasted this long, as combative as ever. But that is part of the problem. The combative nature and the simplicity of his play has made him hard to love. His behaviour has often made him impossible to defend. Off the field, of course, events outside his control (the kiss and tell stories, the Neanderthals that pass for football fans in Northern Ireland, the bigotry that has spewed from the stands at Ibrox) have contributed to the controversy. But Neil Lennon has never shied away from controversy himself. Opposing players, opposing fans, referees, his own players, his own fans. It’s never really mattered to Neil who he fights with. The fight was part of the game and the game was all about winning. It’s fashionable now to laugh at the irony when supporters are offended by players reacting to the jibes from the terraces. That might be a fair point but footballers are paid well enough to stay above the mob. Lennon never could. The sectarian abuse he received was at times sickening – Lennon, perhaps because of his experience with Northern Ireland, seemed unable to shut it out. Lennon liked to dominate referees. Snarling petulance greeted decisions against his team but he could – and would – use all his experience to get other players cautioned. He collected bookings like Henrik Larsson collected goals – but he was almost always too cute to be booked twice in a game. Steven Pressley, now a colleague at Celtic, branded Lennon ‘the common denominator’ in a litany of controversies. It was a statement of fact that was ignored, at least in public, by Martin O’Neill and Gordon Strachan. They knew, unlike an often vocal section of his own support, that Lennon’s simplicity let Celtic play and that the team benefited from such a skilled manipulator of football’s dark arts. And now he will, in a likelihood, bow out with a double – winning as he always wanted to. The honours list will long be tinged by the controversies but, at the same time, Lennon’s stay in Scotland has coincided with a prolonged assault on sectarianism. That unlikely by product of the whirlwind that has surrounded Lennon might just be his greatest contribution to our game. There appears to be something in the water in Edinburgh – and it's not coming from the burst sewage pipe at Seafield. A season of smug satisfaction for Hibs fans looked like it might get even better. One cup was already locked in the trophy cabinet. Kevin Thomson was dumped and Scott Brown returned to equilibrium. European football – and a shot at the Scottish Cup – lay only 90 minutes away. And Hearts were still rudderless and uncertain. Alas hubris is a terrible thing. Since the euphoria of the Hampden victory that captured the CIS Cup Hibs have lost to Hearts, failed to score in three games against the bottom team in the SPL, seen European football disappear and experienced a player rebellion. And still the Scottish Cup hoodoo hangs over them. The player rebellion apparently stemmed from John Collins management style. Too strict, too regimented. No consistency in team selection, no empathy with more experienced players. Fans and the media gathered round Collins, and his assistant Tommy Craig, and berated the players for acting like spoilt children (fans and the media, of course, are major factors in creating an environment where players can act like spoilt children but that is another story) but, tellingly, there was no official statement of support from the aloof Chairman and Chief Executive Rod Petrie. The lack of goals was blamed on the loss of the injured striker Chris Killen. The strict regime was a nod to Collins’ experience in France. The chopping and changing was Collins way of finding out which players he could trust. The press were then treated to the bizarre sight of Collins – so often painted as a thoughtful, intelligent guy – being fed lines by Craig in a press conference. Something was amiss. Eventually the players apologised – but they chose to do this after a miserable draw with Dunfermline in the Scottish Cup. And that, essentially, is the crux of the matter. While a dream cup double and European football were a possibility the fans could hope and cracks could be papered over. But on Tuesday night Hibs' world collapsed. The replay defeat to Dunfermline has left fans angry and bemused. Where, they ask, do Hibs go from here? Thomson’s departure is almost certainly going to be followed by transfers for Scott Brown and Chris Killen. David Murphy and Steven Whittaker may also go. Thomas Sowunmi, a January signing, has failed to convince. Goalkeepers Zibi Malkowski and Simon Brown are on their way out. Guillame Beuzelin is struggling for form and Ivan Sproule is increasingly exposed as a speed merchant without a football brain. Michael Stewart is on his way, along with Stephen Glass, and Shelton Martis may also be packing his bags. The sales of Thomson and Scott Brown alone should raise in the region of £6 million. Which is where the silent Mr Petrie reappears in our story. Because John Collins will see very little of that money for players. In fact, he’ll not see a penny. No transfer fees, no increased wage structure. Which means more youngsters and more untested free transfers. Almost certainly not the experienced campaigner that Collins could so desperately use on the pitch. For Mr Petrie this means a balanced budget. For the fans it means a lack of ambition and mid table mediocrity. For Collins it means that a board that would not publicly support him against the players is unwilling to back him in the transfer market. It is a situation where almost everyone loses. Fans are happy to be impressed by falling debt and new training centres. But only if it is matched on the park. If that doesn’t happen they vote with their feet. Mr Petrie will be the target of the fans ire. John Collins will almost certainly get caught in the crossfire. Collins enamoured the whole of Leith when his side lifted the CIS Cup. It looks like being a shining moment in a brief and unhappy return to Easter Road. Ooh, Aah, Alan Ball's Da'? Alan Ball has died. England’s youngest World Cup winner (or England’s eleventh oldest World Cup winner) succumbed to a heart attack at the age of just 61. Down south, of course, this gives the media the chance to revel in the kind of mass grief that they have perfected since ‘The People’s Princess’ died. For those of us in Scotland it means we are reminded once again about 1966 and all that. Ah, those painful memories of non goals and pitch invasions! But at least it allows us our own spot of navel gazing: 1967 and Alan Ball’s entry into the Scottish Football Hall of Fame. Ball it was that Jim Baxter targeted to feel the full force of his genius at Wembley that day. Sir Alex Ferguson has said that Baxter’s performance could have been set to music. It would be the sound of Alan Ball being tortured. When Denis Law urged Baxter to cut the fancy stuff and go for goals Slim Jim just smiled and continued with his repertoire of tricks. This included exchanging more than 20 passes with Billy Bremner and Tommy Gemmell as Ball scurried between them trying in vain to get the ball. The masters became the tormented slaves. 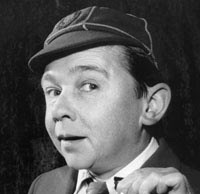 Jimmy Clitheroe, of course, was a comedian who happened to be Lancastrian, squeaky voiced and very, very short. 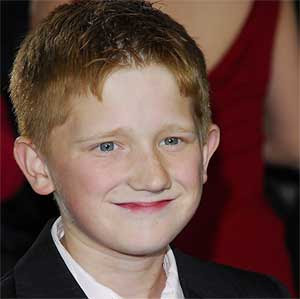 The short, squeaky voiced Lancastrian Alan Ball recognised the force of the insult. To his eternal credit Ball, though furious, kept his head. One always got the impression, however, that he was never quite able to forgive or forget the day Jim Baxter stole Wembley. Both Baxter and Ball are gone now. They followed different paths in both life and death. But both left memories of great games and great talent. That, not the mocked up hysteria of the English press, should be their lasting legacy. So you've watched your league lead dwindle to one point. You're mystified about the lack of goals coming from your once prolific attack. The last thing you probably want is your own match "announcer" taking the mickey. But as Gretna's players slumped to the turf on Saturday after a goalless draw with Clyde - which left St Johnstone not so much breathing down their necks as enveloping them in a half nelson - they were assailed by Queen and David Bowie's Under Pressure blaring out from the tannoy. Nice, if nothing else, to see gallows humour alive and well in Gretna. OK. So I’m back again after another inexcusable absence. What’s happened since I’ve been away? 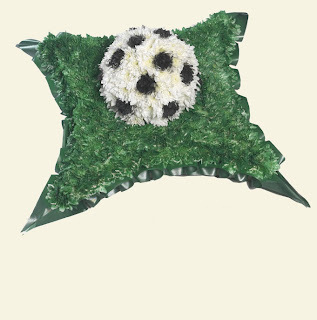 Well, Celtic have won the SPL – finally. St Mirren remain ahead of Dunfermline – but only just. And Gretna are making hard work of wrapping up the First Division. But more of that later. In the meantime welcome back.